DO you watch Collectors on ABC1? That nasty business aside I have been an avid fan for a couple of years and one of the segments I love is when people dig their precious bits out of the back cupboard and send them in to, lets say, "learn" more about them. I wait every single week for someone to not ask whether the item is of value. Well, as it so happens, I have an op-shop find I want to send in. Meet Odette. 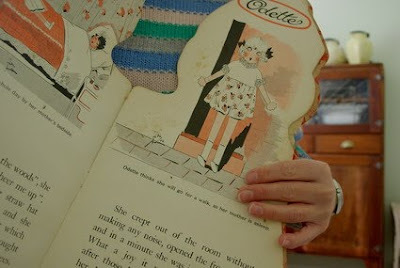 Odette reminds me of a series of paper dolls, with accompanying storybook, that were about when I was a child. I can't remember the names of those dolls but there was a set. Odette is part of a set too. She was printed in France for Dean & Son, Ltd, of London, and has sisters Nanette, Minette and Babette. 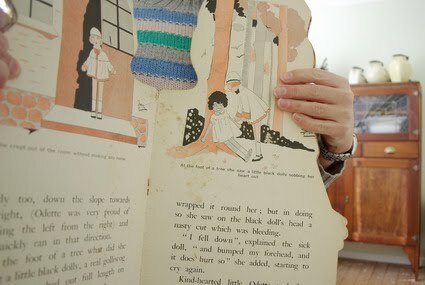 This book, Odette and the Good Fairy, is in pretty poor condition. She's terribly water damaged and her head is hanging on with old and brittle Sello tape, but goodness, she is 80-odd - maybe even 90-odd. The gollywog (spelled golliwog in the book) and the cute little outfit she's wearing made me think she's a wee lass from the 1930s but I'm unsure. What do you think? Oh, and how much do you think she's worth? She's so pretty! Yes, I agree - I think she's the 30s for sure. Look at her flapperesque cupid bow mouth and big baby blue eyes! As for how much....well I couldn't say. I ebt if it was put up on ebay though you'd get some serious bidding! oh cute. yes, nasty business aside, i like the show too. send it in, you might get on tv! I think she is .... 'priceless'. She is so so pretty. No idea how much she is worth, but I would definitely hold onto her. 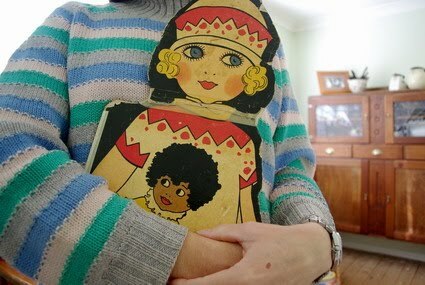 You could even scan her and print her out so you could have your own 'new' copy. . .. Just a thought! Hold on to your head Odette! She's gorgeous. And PMM is a clever chook. And judging by the grip on Odette? Priceless. No idea what she would be worth, but... wow! So lovely. Books like that are the best!! She's fascinating. 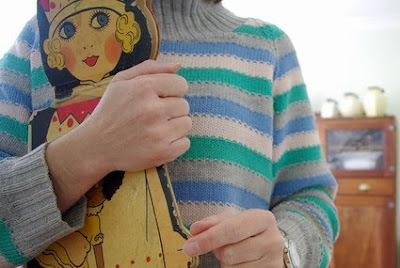 She'd make a great model for your drawings of op-shop finds. What an adorable find... you must seek out the rest of the series. I would hate to even attempt to put a value on it, despite it's $ value, it's worth having the set for the nostalgic value alone. She is so lovely - I agree, priceless!